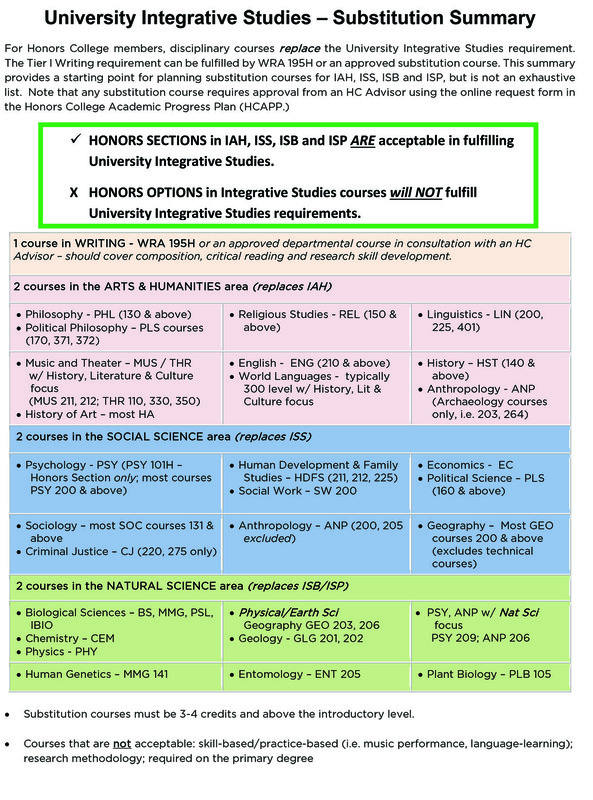 All courses intended to meet Honors College University Integrative Studies Substitutions must be approved via the Honors College Academic Progress Plan (HCAPP). University Lab and University Diversity Distribution requirements linked to University Integrative Studies are eligible to be waived upon completion of all substitutions and approval by an Honors College academic advisor. Even so, the Honors College encourages students to engage in international/multicultural diversity opportunities via General Education coursework. Any University Integrative Studies courses (IAH, ISS, ISB, ISP) intended for general education requirements must be completed as Honors Sections. Honors Options in Integrative Studies courses will NOT fulfill the general education requirement.